Benjamin Graham taught that Intelligent Investors must do a thorough fundamental analysis of investment opportunities to determine their intrinsic value and inherent risk. This is best done by utilizing a systematic approach to analysis that will provide investors with a sense of how a specific company compares to another company or by reviewing the 5 Undervalued Companies for the Defensive Investor Near 52 Week Lows. By using the ModernGraham method one can review a company’s historical accomplishments and determine an intrinsic value that can be compared across industries. What follows is a specific look at how Starwood Hotels & Resorts (HOT) fares in the ModernGraham valuation model. 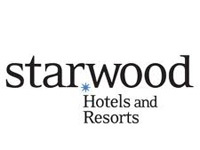 Company Profile (obtained from Google Finance): Starwood Hotels & Resorts Worldwide, Inc. (Starwood) is a hotel and leisure company. The Company conducts its hotel and leisure business both directly and through its subsidiaries. Its brand names include St. Regis (luxury full-service hotels, resorts and residences), The Luxury Collection (luxury full-service hotels and resorts), W (luxury and upscale full service hotels, retreats and residences), Westin (luxury and upscale full-service hotels, resorts and residences), Le Meridien (luxury and upscale full-service hotels, resorts and residences), Sheraton (luxury and upscale full-service hotels, resorts and residences), Four Points (select-service hotels), Aloft (select-service hotels), and Element (extended stay hotels). The Company is organized into two business segments: hotels and vacation ownership and residential. In May 2014, the Company sold its leasehold interest in Park Lane Hotel, London to Sir Richard Sutton’s Settled Estates (SRSSE). 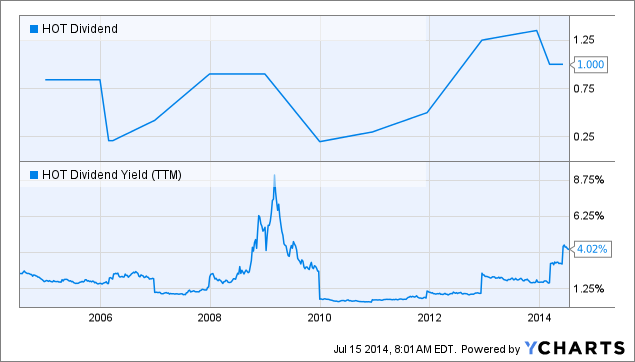 Starwood Hotels & Resorts is not suitable for either the Defensive Investor or the Enterprising Investor. In fact, the only things the Defensive Investor likes about the company are the fact that it has a market cap greater than $2 billion and the fact that its dividend record. The Enterprising Investor has significant concerns with the level of debt relative to the current assets. As a result, value investors following the ModernGraham approach based on Benjamin Graham’s methods should explore other opportunities. As for a valuation, the company appears to be fairly valued after growing its EPSmg (normalized earnings) from $1.49 in 2010 to an estimated $2.62 for 2014. This level of earnings growth supports the market’s implied estimate of 11.63% earnings growth and leads the ModernGraham valuation model, based on Benjamin Graham’s formula, to return an estimate of intrinsic value within a margin of safety relative to the price. The next part of the analysis is up to individual investors, and requires discussion of the company’s prospects. What do you think? 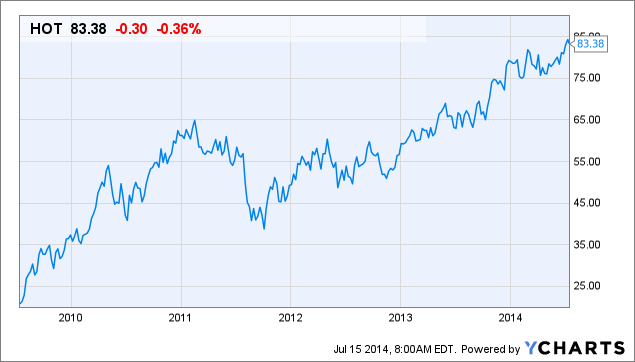 What value would you put on Starwood Hotels & Resorts (HOT)? Where do you see the company going in the future? Is there a company you like better? Leave a comment on our Facebook page or mention @ModernGraham on Twitter to discuss. Disclaimer: The author did not hold a position in Starwood Hotels & Resorts (HOT) or in any other company mentioned in this article at the time of publication and had no intention of changing that position within the next 72 hours. Logo taken from wikipedia for the sole purpose of identifying the company; this article is not affiliated with the company in any manner.